The Allied Vision Goldeye cameras produce outstanding low-noise images with a high dynamic range, thanks to a high sensitivity InGaAs sensor with active thermoelectric cooling (TEC). A version with additional external cooling (COOL) is also available, optimised for applications that require long exposure times. In combination with 14-bit image processing and numerous onboard image correction features, Goldeye cameras produce an outstanding low-noise image quality. All the cameras in the range have the same compact and ruggedised housing. Comprehensive I/O control and multiple mounting options facilitate simple system integration. In addition, locking functionality at all connectors enables secure operation. Learn about Short-Wave Infrared technology in this presentation by Allied Vision's Ludger Kemper at the Control 2016 show. The Goldeye has been designed to produce an excellent image with very low noise by incorporating 14-bit image processing and numerous onboard image correction features. Coupled with the thermoelectric cooling system this achieves outstanding, low-noise image quality that is constant, independent of the ambient temperature. 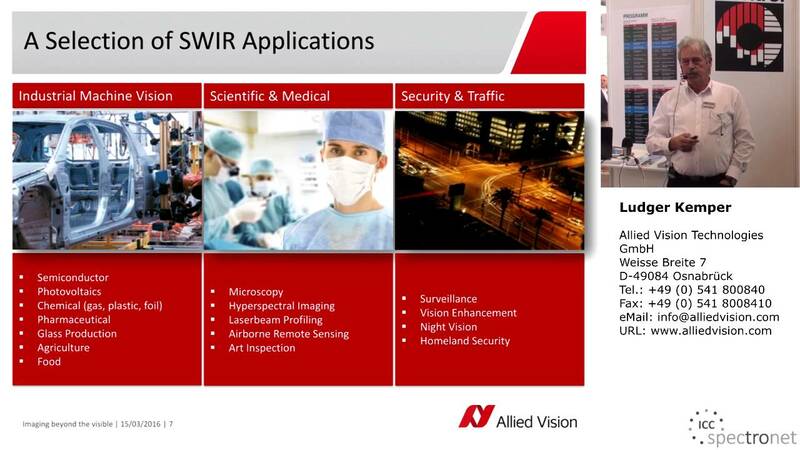 Operating in the sensitive in the NIR/SWIR spectral range from 900 nm – 1700 nm, these cameras open up numerous possibilities for machine vision solutions. With their simple integration design, they are the perfect choice for industrial and scientific applications beyond the visible spectrum. 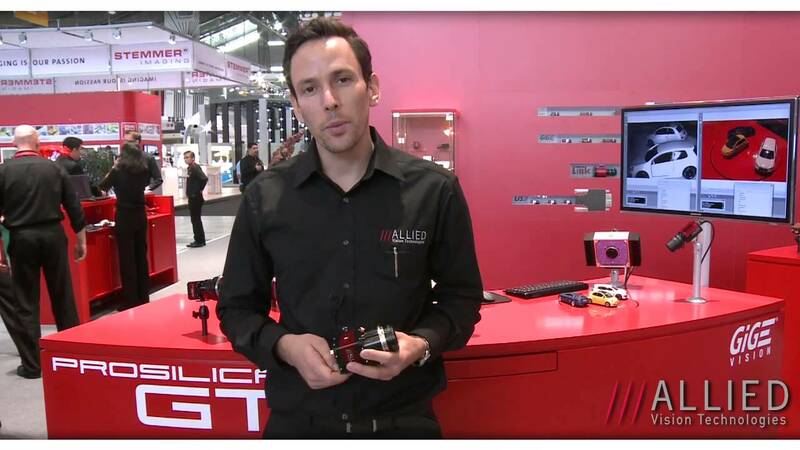 The Goldeye is available with two industrial connection options - GigE Vision or CameraLink. Depending on the application requirements, there is a choice between two variants of Peltier cooling (TEC1 or TEC2) as well as a model with additional external cooling function (COOL). The COOL version uses a nitrogen-filled cooling chamber that allows the sensor temperature to cool down until 60 Kelvin. The increased sensor cooling suppresses dark current noise in particular and thus enables very long exposure times of up to 10 seconds for SWIR cameras. This property is particularly relevant in particularly demanding inspection applications in the scientific environment and industry. For temperature-stable environments, the perfect choice is the model without cooling (TECLESS). AV GOLDEYE CL-008 SWIR COOL TEC1 C-MOUNT 0.08 344 C-mount 320 256 2/3"
AV GOLDEYE CL-008 SWIR TEC1 C-MOUNT 0.08 344 C-mount 320 256 2/3"
AV GOLDEYE CL-008 SWIR TEC1 F-MOUNT 0.08 344 F-mount 320 256 2/3"
AV GOLDEYE CL-008 SWIR TEC1 M42-MOUNT 0.08 344 M42 320 256 2/3"
AV GOLDEYE CL-032 SWIR COOL TEC2 C-MOUNT 0.32 100 C-mount 636 508 4/3"
AV GOLDEYE CL-032 SWIR TEC1 C-MOUNT 0.3 100 C-mount 636 508 4/3"
AV GOLDEYE CL-032 SWIR TEC1 F-MOUNT 0.3 100 F-mount 636 508 4/3"
AV GOLDEYE CL-032 SWIR TEC1 M42-MOUNT 0.3 100 M42 636 508 4/3"
AV GOLDEYE CL-033 SWIR TEC1 C-MOUNT 0.3 301 C-mount 640 512 4/3"
AV GOLDEYE CL-033 SWIR TEC1 HSI C-MOUNT 0.3 301 C-mount 640 512 1"
AV GOLDEYE CL-033 SWIR TECLESS C-MOUNT 0.33 301 C-mount 640 512 1"
AV GOLDEYE G-008 SWIR COOL TEC1 C-MOUNT 0.1 344 C-mount 320 256 1"
AV GOLDEYE G-008 SWIR TEC1 C-MOUNT 0.1 344 C-mount 320 256 2/3"
AV GOLDEYE G-008 SWIR TEC1 F-MOUNT 0.1 344 F-mount 320 256 2/3"
AV GOLDEYE G-008 SWIR TEC1 HSI C-MOUNT 0.08 344 C-mount 320 256 2/3"
AV GOLDEYE G-008 SWIR TEC1 M42-MOUNT 0.1 344 M42 320 256 2/3"
AV GOLDEYE G-032 SWIR COOL TEC2 C-MOUNT 0.32 100 C-mount 636 508 4/3"
AV GOLDEYE G-032 SWIR COOL TEC2 F-MOUNT 0.32 100 F-mount 636 508 4/3"
AV GOLDEYE G-032 SWIR COOL TEC2 M42-MOUN 0.32 100 M42 636 508 4/3"
AV GOLDEYE G-032 SWIR TEC1 C-MOUNT 0.32 100 C-mount 636 508 4/3"
AV GOLDEYE G-032 SWIR TEC1 F-MOUNT 0.32 100 F-mount 636 508 4/3"
AV GOLDEYE G-032 SWIR TEC1 M42-MOUNT 0.32 100 M42 636 508 4/3"
AV GOLDEYE G-033 SWIR TEC1 C-MOUNT 0.33 301 C-mount 640 512 1"
AV GOLDEYE G-033 SWIR TEC1 F-MOUNT 0.33 301 F-mount 640 512 1"
AV GOLDEYE G-033 SWIR TEC1 M42-MOUNT 0.33 301 M42 640 512 1"
AV GOLDEYE G-033 SWIR TECLESS C-MOUNT 0.33 301 C-mount 640 512 1"